Moisturizer, eye cream, lotions and potions. While I’m all over a great anti-aging product, I have the opposite opinion about my terra cotta pots. this is the George Clooney of pots. 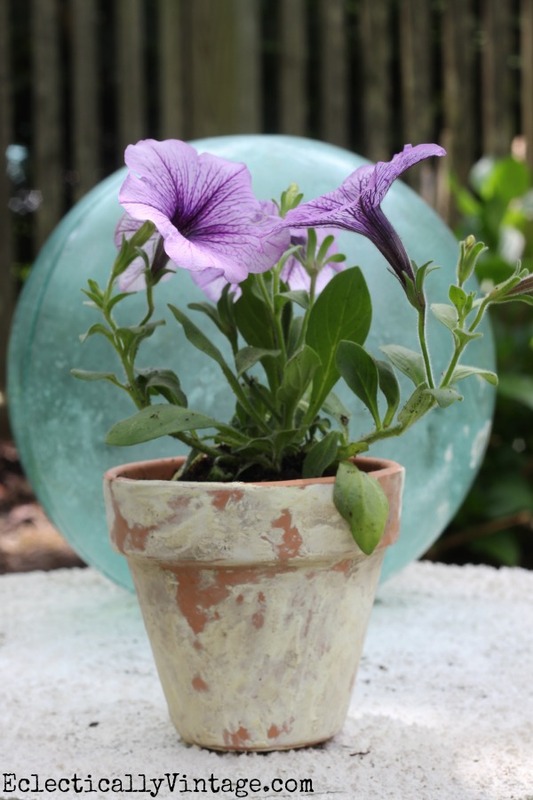 I got the idea from my friend Karen – check out her pots that have been aging in the garden for more than seven years and they just keep getting better. I went a slightly different route since I couldn’t find what she suggested and I love the way they turned out. at least in the garden. Check out my patio in all it’s vintage glider glory. « Previous: My Florida Escape – and Dream Vacation Giveaway! spackling paste- that’s a great idea!!!!!! thanks! 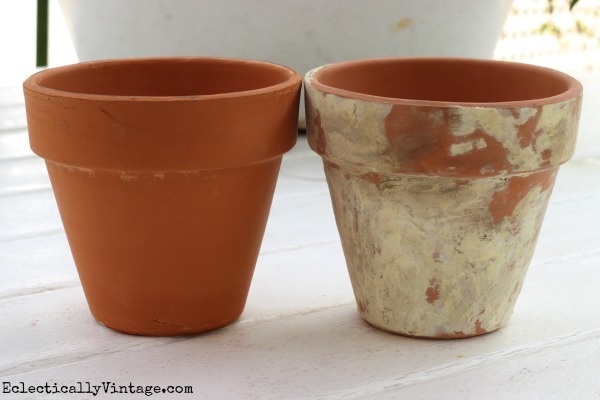 Thanks for the tips Kelly!…Many, many years ago, when my terra cotta pots looked old and grungy, I threw them away…wanted clean and pretty pots….and now, we are trying to make them that way!…and I totally love it that way now!. looks like your pot is going to try to steal your anti-aging potions … don’t let her, she’s perfect! It looks great. I like the clay pots as is but they look great aged too! So very pretty! Living up to you blog name Kelly! I agree, the aged pots look better! Kelly, love, love, love this, thanks for sharing. I’ll be doing this for the fall in the new house for sure!!! I won’t have time to plant for the summer since we get in next week. Imagine these with mums, GORGEOUS!!! PINNED!!! Love this, Kelly! 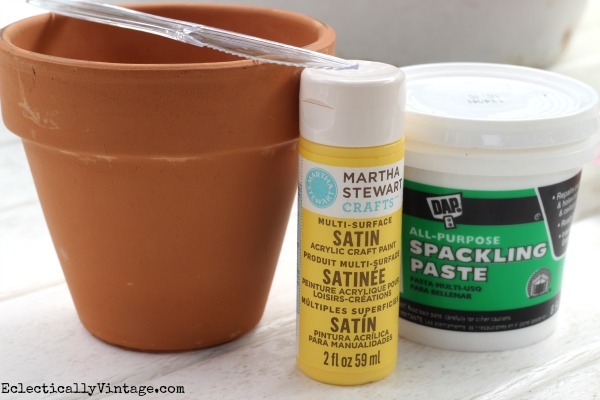 I used to spend hours soaking my pots in vinegar then scrubbing off the…let’s call it “Patina”, to make them look new. That was a total pain in the backside. Seems to me that this will actually add a layer of protection to the clay and I love the way it looks. An Ivy topiary would be very pretty. Thank You!! I like your method much better too! Thank you for the mention 🙂 Love the color, but don’t put this stuff on your face. I haven’t heard of that Liza – give it a try!